New formula in a functional aerosol design! Formulated for Suede Leather and Nubuck. 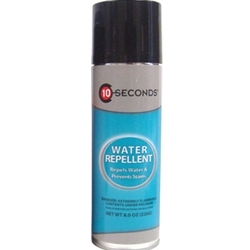 10-Seconds Water Repellent is the most effective barrier against water, snow, ice and rain, still allowing leather to breathe. For use on all dry clean only fabrics. NOTE: Due to ORM-D regulations, we cannot ship aerosol products via PO Box, APO or any military addresses.